If your Life Points are higher than your opponent's Life Points, activate this card's effect by offering this card as a Tribute from your side of the field. Inflict damage to your opponent's Life Poin..
Pay 500 Life Points to select 1 "Mystical Shine Ball" from your hand or Deck, and Special Summon it to your side of the field.".. This card is unaffected by any Spell Cards. 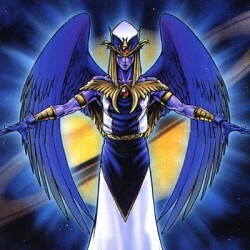 If there is "The Sanctuary in the Sky" on your side of the field, and your Life Points are higher than your opponent's Life Points, increase the ATK and DEF..
As long as this card remains face-up in Attack Position on the field, this card is not destroyed as a result of battle at any time, although damage calculation is applied normally. A monster that batt.. This card cannot be attacked if there is another Zombie-Type monster on your side of the field. Each time a Zombie-Type monster is Special Summoned successfully, send 2 cards from the top of your oppo..
Each time this card inflicts Battle Damage to your opponent's Life Points, declare 1 card type (Monster, Spell or Trap). Your opponent selects 1 card of that type from his/her deck and sends it to the..